Here is a quick reference guide on how to grow potatoes. Potatoes are grown as annual vegetables. The potato plant is easy to grow with generally good yields, but requires protection from frosts. Growing potatoes can use up a fair bit of space, but they’re productive plants that are also useful for clearing ground. Position: Potato plants prefer an open and sunny position but will tolerate a small amount of shade. Potatoes are hungry feeders and require humus-rich, heavily manured, free-draining soil. Growing potatoes in a slightly acid soil (pH 5-6) is preferable as they don’t like alkaline soils. It’s important not to plant potatoes in beds where potatoes have been grown within the last 3 years. Avoid garden beds that have been limed as lime tends to encourage potato scab. Sprouting method: Before planting potatoes, they should be sprouted, or chitted. Always buy certified ‘seed’ potatoes, which are guaranteed to be healthy. In late Winter or early Spring, place seed potatoes in egg boxes with the end having the most eyes pointing upwards. Leave in a light, warm place out of direct sunlight until sprouting starts. Then move to a cooler place for 4-6 weeks before planting outside. Shoots should be about 1cm before planting. Sowing method: Plant with sprouts facing upwards in holes or trenches 10-15cm deep. Cover with soil. Spacing: Depends on cultivar, generally plant smaller and earlier variety seed potatoes closer together (30cm apart, rows 50cm apart) and larger and later varieties further apart (40cm apart, rows 70cm apart). If you're planting in tyres, plant two seed potatoes in each tyre. Watering: Keep soil moist, especially when plants are flowering. Water soil rather than the potato plant. Don’t over-water or potatoes will rot. Fertilising: Fertilise soil when planting and again about one month after shoots appear. Use a good organic fertiliser such as blood and bone or seaweed extract. Liquid comfrey will help deter scab. Earthing up: Potato tubers must be protected from sunlight or they turn green and toxic. Earthing up around shoots and tubers also gives some protection from pests and diseases. Mulch up around shoots after 2-3 weeks when they reach about 15cm height, leaving some foliage showing. Earth up regularly until flowers appear. Size: Depends on cultivar, but potato plants are large and sprawling. Harvesting: Dig up as the foliage dies back down after flowering. Harvest on a dry day. Potatoes can be left in the ground but this exposes them to diseases. Suitable for: Large containers, vegetable beds, inside old tyres. If you're using old tyres, make sure they're well-drained. Good companion plants: Cabbage, beans, carrot, celery, corn, onion. Bad companions: Tomatoes, eggplant and other nightshade family members are bad companions for potatoes as they can contaminate each other with blight. Don’t even plant them in the same bed following each other in the next growing season. Potatoes are better off away from cucumber, parsnip, turnip, pumpkin, kohlrabi, rutabaga, squash, sunflower and fennel. Common diseases: Blight, scab. Comfrey can provide some protection from scab. Tips: Cultivars are available with resistance to pests and diseases. Potato plants are great ground clearers and the extra manuring required prepares garden beds well for following crops. 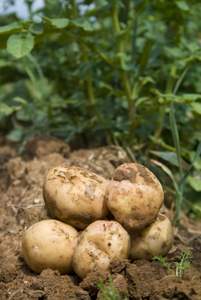 See this article for information on how to grow potatoes as you're building raised garden beds.